An income tax return (ITR) is a proof that an individual has paid income tax and helps to establish a record of the same with the income tax department. In India, the Income Tax Act (1961) states that an individual with gross total income (i.e. total income prior to deductions available under chapter VI A of the act) exceeding the exemption limit is required for filing ITR. This applies even if all the taxes have been paid and/or if tax has been deducted at source from the income. An ITR form is more comprehensive than Form 16.The latter only includes salary and tax deductions from one employer while the former includes income from multiple sources. Deductions include payments towards the Provident Fund, NPS, PPF, NSC, and rent, tuition fee for children and life and health insurance premiums. There are many advantages of filing tax returns on time. 1. Allows availing loans from banks: Firstly, filling an ITR helps in procuring bank loans. While applying for education, vehicle or housing loan, banks ask for ITRs as standard proof of income. Furthermore, if your application for a loan is rejected or the amount sanctioned as loan is less than required, using a copy of the ITR, you can ask the bank to review your application. Additionally, a bank may not issue a credit card, if you have not been filling your tax returns regularly. 2. Helps get insurance cover: Secondly, tax returns are required to verify your annual income while applying for life insurance (especially of 50 lakhs and above). This is because the income of the ensured is a determinant of the sum that is ensured under a particular policy – the higher the income, the higher the insurance cover. 3. Helps in getting a visa: For those working and applying for a visa, a copy of an ITR is a prerequisite. Some foreign consulates require copies of ITRs from the preceding three years at the time of the interview as the returns act as proof of a job and income in India. This improves the chances of an applicant getting a visa as they are more likely to come back to India, rather than seek a job overseas. It also provides foreign countries with information regarding your financial soundness, before granting a visa. 4. Mandatory for getting tax refunds: It is required that the return be filed for the concerned year to claim tax refunds (i.e. the amount an individual is entitled to claim back in case of payment of tax in excess of the amount required) from the Income Tax department. Without filling the returns, an individual has to forego the returns for the year. Furthermore, if the income tax department delays sending the refund to you, it is liable to pay interest on the refund from the day the refund becomes due. However, if the return is filed late, in case of a delay on the behalf of the income tax department, an individual does not get any interest for the period of delay. 5. Allows adjusting of capital losses: It is advantageous to file returns if you wish to carry forward capital losses (both long term and short term) and adjust them against capital gains in subsequent financial year. This allows one to reduce ones taxable income in subsequent years. However, if you do not file returns in time, such adjustments cannot be made. 6. Pre-requisite for getting government tender: While starting a business, an individual may be required to fill out government tender form/s. To do the same, the individual in question is required to furnish copies of tax returns (businessmen, consultants and partners of firms are not eligible for Form 16) from the previous five years a proof of financial ability and ability to meet the payment obligation to the government. However, this requirement and the number of ITR forms required varies depending on the internal rules of the government department involved. 7. Needed for acquiring permit for immoveable property: A copy of the tax returns benefits those applying for permits for immoveable property as their application is likely to be processed in a in a faster and easier fashion. 8. Proof for financial transactions for the self-employed: For the self-employed, tax return receipts are the only proof of income and tax payments, for conducting financial transactions. 9. Saves you from paying a penalty: Finally, the union budget 2017 states that if the ITR is not filed by 31st December, the taxpayer is required to pay a penalty of R.5000 and after 31st December is required to pay a penalty of Rs.10,000. The penalty is capped at Rs 1,000 for income of up to Rs 5 lakhs. Thus, it is recommended tax returns be filled by the 31st of July of every year to avoid paying a penalty. Additionally, if the returns are not filed in time, an individual is required to pay interest on tax dues when returns are filled at a later date. The interest is charged at the rate of one percent for every month after the due date till the date of filing the return. 10. Makes you a responsible citizen: Furthermore, if you file your returns regularly, you are free from the scrutiny of the tax department in the form of notices, raids or searches. You also contribute to the national income and establish a steady record with the income tax department as a responsible citizen. Thus, given the above advantages of filing tax returns and the ease with which tax returns can be filled using the e-filling facility, it is in the interest of every earning individual to file tax returns in a timely fashion. 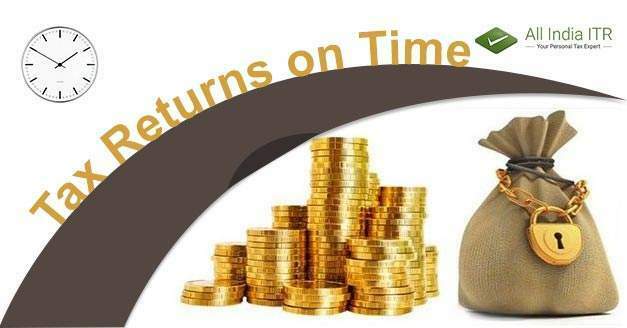 Through this blog i came to know about the Key Benefits of Filing Income Tax Returns on Time. Interestingly enough, i saw this blog and though i read with much anxiety.This is the blog that i needed and i have been searching such blog from a very long time now but today finally i found it and that to even in such an easy language which was really easy for me to understand and very easy to learn from it.